We Bengalis can’t live without sweets and desserts. We carry the sweet tooth in our genes. No matter how satisfying our gastronomical experience might be and, how stomach-full we feel after having it, we need a dessert. In my case, the crave for sweets is never-ending, but I love home-made desserts. The amount of sugar or sweetener in homemade dishes can be measured and even it’s not difficult to put a calorie check by using low-calorie sugar substitutes. 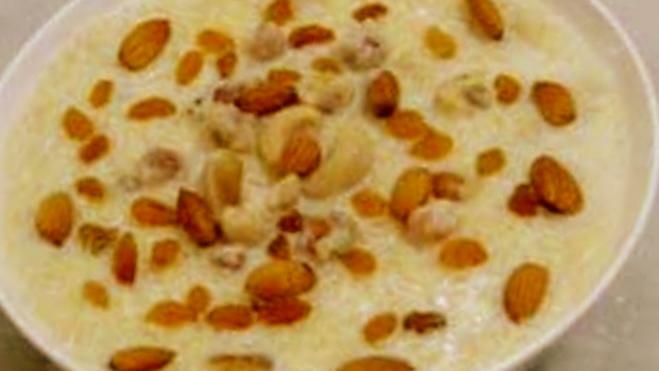 Of all the authentic Bengali desserts, perhaps the most delightful and healthiest one is payesh or rice pudding. It is made with Ambemohar Rice (Gobindobhog chaal), milk, raisins, cashews, a pinch of saffron (optional), and sugar. But today I’m going to share the recipe by using Sugar Free, the zero calorie sugar substitute instead of sugar. 1. Wash the rice and drain all the water. The rice should be dry. 2. Soak the raisins in water for 15-20 minutes. The raisins will get swollen. 3. Pour the milk in the pan and start boiling it on a low to medium flame. Be very careful, otherwise it might either stick to the bottom of the pan or spill over. You have to bring the volume to 2/3 of the original volume. I cook it totally on a low flame. 4. On another pan, heat up the ghee and then, add the bay leaves and green cardamoms to it. Saute them for a minute, add the rice. saute for 2-3 minutes. Add them to the boiling milk. Add a pinch of salt. 5. Let the rice become soft, keep on stirring continuously while cooking on a low flame. 6. Add Sugar Free Natura at this point. 7. Once the rice is cooked, add the cashews and the raisins. The volume of the milk should be reduced considerably. Some like it to be thick (me too) but, you can keep it a bit liquid according to your taste. Unlike many other desserts, payesh or payasam doesn’t taste best when served hot. Serve it warm or keep it in the refrigerator to serve later. It tastes best when served cold. Garnish with almonds before serving. My dida used to make nolen gurer payesh…ki bhaalo hoto khete! I know I would easily enjoy it Maniparna! It looks so delicious! Thanks for sharing! Yes…. though I try to inculcate some of the bengali traits in me ..
Payesh, phirni, kheer and tasmai. All different but almost same. Yuk, very confusing. Though, I liked them all. I carry one tooo …He he he he that just reads yummmy. .. This recipe is similar to our ‘kheer’, the only difference is that we don’t use bay leaf and ghee. It is very delicious and is the basic sweet dish in Punjabi homes. Lip smacking payasam (as in south!) and that too without the calories of sugar is indeed a bonus! Payesh without sugar..yet sweet .makes a yummy treat! Sounds and looks quite delicious!